Aechmea weilbachii var. leodiensis. A description of this bromeliad is given on page 40. The artist, Mr. Hobbs, states that the double inflorescence is fairly common in New Orleans and that he had a plant that developed six complete flowering bracts, each with a full complement of flowers. HEN THIS WRITER first started to grow bromeliads about twenty years ago, fertilizing these plants was not considered necessary. It was believed that because bromeliads were epiphytes, they did not need feeding as did regular plants that had their roots in the ground. Little by little, however, the fallacy of this way of thinking became apparent, until today about ninety percent of those who grow bromeliads feed them at regular intervals. In their need for minerals vital to their existence, bromeliads are no different from other plants. Marston Bates in his fascinating book The Forest and the Sea brings out this point and makes some interesting comments on the air plants which grow in the tropical rain forests of South America. As these plants have no direct access to the ground, they are faced with the great problem of obtaining enough food and water to keep them alive. Bromeliads, Mr. Bates tells us, are fortunate in having solved this problem by the formation of their leaves into water-tight tanks, which make first-rate containers for water and rotting organic matter. In fact, bromeliads can hold so much water that they have been referred to as "marshes in the treetops." It is the common belief that the roots of epiphytes serve only as a means of supporting the plant to the host tree. According to Mr. Bates, the roots of bromeliads and other air plants are also a means of absorbing food. This food may be obtained from the humus or debris that may collect in cracks in the bark of the tree or from the fungi which are found living in close relationship with the roots of many plants. As many plant explorers well know, the roots of epiphytes also serve as the nesting sites for ants, which Mr. Bates says benefit the plant in two ways. First, the material which the ants collect to build their nests acts as food for the plant, and second, the ants provide a means of defense for the plant against those avid human beings who desire to bring the plant home to their greenhouse. If our bromeliads need food in their native habitat, it would most certainly seem that they need fertilizing when brought under cultivation. For those who grow their bromeliads outdoors on trees or in the ground, feeding is probably not necessary; but for those who must raise their plants in pots under artificial conditions, fertilizing must be resorted to if the plant is to reach its optimum beauty. Practically all the members who feed their bromeliads use a liquid form, weakly diluted. What kinds of fertilizers are used? The answers most frequently submitted were as follows: "Anything I have around the house," "the same as I feed my orchids," fish emulsion, Orthogro, Rapid-grow, and Hyponex. It would seem from the wide diversity of answers that "anything goes" so far as feeding is concerned, as long as the fertilizer is a well-balanced one and is applied at regular intervals. In this issue we conclude the descriptive listing of the Aechmeas most commonly found in American cultivation. There are many very beautiful Aechmeas not listed, but these are difficult to obtain; however their descriptions will be given in later issues. The next issue will contain a listing of the better known Billbergia species. HE VAST MAJORITY OF BROMELIADS, being largely epiphytic, are moderate sized as is the case with most herbaceous species. Their natural habitat, though specialized, is a limiting one, at least as far as growth is concerned. Lack of contact with true soil and its more generous supplies of nutrient material and moisture tends to keep most epiphytes, including bromeliads, on the small size. Certain terrestrial species demonstrate the value of true soil in their capability of growing much taller, the best example being tree-like Puya raimondii of the high Andes of Peru and Bolivia, No epiphytic bromeliad can compete with Puya in over-all dimensions, though under certain favorable conditions giant epiphytic species have evolved. 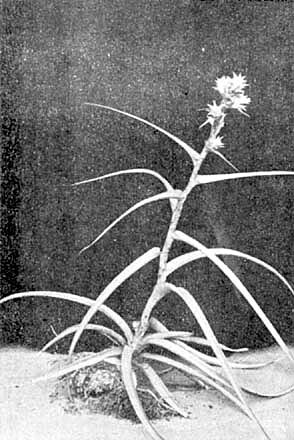 One such, Glomeropitcairnia penduliflora (Grisebach) Mez, is probably the giant of all Antillean bromels. Only a companion species, G. erectiflora of Trinidad, is possibly as massive. A native of wet mountain forests of certain of the volcanic Lesser Antilles (Dominica and Martinique), the mature leaf rosettes of G. penduliflora are up to 6 feet tall, measure 6 to 8 feet in diameter and at time of flowering the branching inflorescence with its yellow pendulous flowers often rises to 10 or more feet in height. The impressive size of this epiphytic herb is possible because of the ideal conditions under which it grows. The incessant north-east trade wind, forced upwards over the mountaintop home of this species, is cooled and thus continually releases abundant moisture in the form of clouds or rain resulting in high precipitation, well distributed throughout the year. In its Dominica habitat this rainfall is probably never less than 200 inches a year and may on occasion nearly double this amount. The constant high humidity results in heavy growth of all kinds of "air plants", including mosses which often cover tree branches with heavy mats, an excellent aerial "soil" for bromels and other companion vascular epiphytes. Under such conditions G. penduliflora is able to grow vigorously year in and year out, forming its giant tank rosettes that take over any available perching spot throughout all levels of the rather low-statured mossy forest. Once an individual matures, flowers and sets seed, it dies. Botanists call plants with such a life cycle monocarpic, meaning "one-time flowering". Thus this bromeliad's life cycle (and life form) resembles that of the century plants (Agave) of our southwestern deserts. Just how long it takes G. penduliflora to attain flowering age in nature is not presently known. However, Mulford Foster has reported in this Bulletin (Volume VI, No. 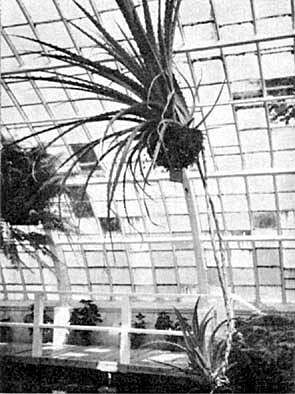 2:18, 1956) on a "magnificent specimen" growing in his collection at Orlando, Florida, nearly 6 feet tall (and) almost 16 years of age" (in 1956) raised from seed collected by the writer in Dominica in 1940. Glomeropitcairnia penduliflora growing in mossy forests on upper slopes of Morne Plat Pays, Dominica, W. I.
Glomeropitcairnia penduliflora, a member of the sub-family Tillandsioideae, was first described by the German botanist Grisebach, (under the earlier name Tillandsia penduliflora), in 1864 from herbarium material sent by the Scottish physician John Imray from the British island of Dominica, where he was resident and a pioneer collector of the local plants. I am not aware of whether a specific Dominica locale appears on the original specimen, but since this giant bromel is common on the mountains immediately accessible to the principal town of Roseau, it is more than likely that the upper slopes of one of these peaks (such as Morne Anglais, elevation 3748 feet, or Morne Plat Pays, elevation 3242 feet) is the type locality for this species. 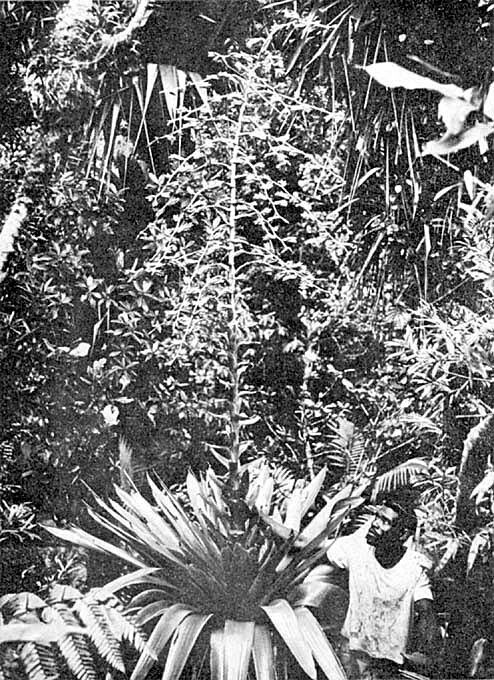 The writer first met this giant bromeliad during the period 1937-1940 while conducting botanical studies in the field in Dominica. During February of 1961 I revisited Dominica on behalf of Longwood Gardens to collect certain native plants with potential horticultural interest. One of these was this plant which was found to be as abundant as ever on the upper slopes of Morne Plat Pays where it fraternizes with other local bromels such as Guzmania megastachya, G. dussii and G. plumieri. The accompanying photograph shows a typical mature plant in its native mossy forest home. Unfortunately, no viable seed was encountered, but a number of young plants were collected. Obviously a mature specimen would be too difficult to handle in shipping! Small plants now growing in the conservatory collection at Longwood Gardens should eventually help to demonstrate to visitors the extreme size reached by certain epiphytic species of the bromeliad family. In the words of Mulford Foster "The breathtaking proportions make it a spectacular bromeliad, well worth the long period of growth from seed to maturity; in fact, its firm blue-green strap-shaped leaves make it a beautiful decoration even if it never produced an inflorescence." —Longwood Gardens, Kennett Square, Pa.
Euler—"we can place our highest hopes in observations they will lead us continually to new properties which we shall endeavor to prove afterwards." WO YEARS AGO THE WORD "BROMELIAD" was unknown to me. Frances and I were apartment dwellers, but I had been softened up to the point where we were looking for a house. My attitude was a negative sort of thing. I didn't want anything too far from my work and I didn't want a piece of land any larger than could economically be planted in green concrete. Frances must have had an infinite amount of patience, because we eventually found something that seemed to be a happy solution for both of us. Shortly after we became installed in our new home, and before I started on my plan of putting in green concrete, I saw a bromeliad. From this point on, plans changed, and in rapid succession we started a program of planting, joined the Bromeliad Society, and bought a few bromeliads. Some months later I was able proudly to display one of my bromeliads to my mother, but her only comment was that it didn't look very "thrifty." In contemplating this thought, I recalled numerous references to "happy" plants in the Bulletin. When I first became interested in bromeliads, I didn't anticipate this idea of worrying about my plants being "thrifty" or "happy." How does one determine these things? Obviously I must learn more about bromeliads. I am an engineer, and my natural inclination is to approach my problems with a slide rule in one hand and a book of mathematical tables in the other. The question was, "What are the factors involved?" 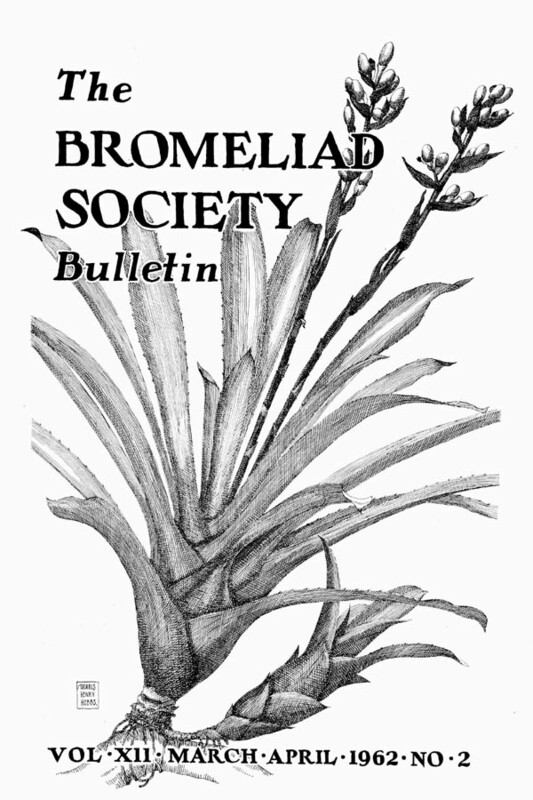 The first step in my program to know more about bromeliads was to obtain some of the back issues of the Bulletin and start reading. One of the things I ran across that impressed me very much was the reproduction of an M. B. Foster painting "Macrocosmic Revelation." This reproduction appeared on the cover of the May-June 1957 Bulletin, and Racine Foster commenting on the subject pointed out, "Revelation comes through observation and well developed sensitivities." The entire article is very much worth reading and re-reading. "Observation" is the beginning point in any engineering or scientific endeavor. With this thought in mind, I began to reason with myself in somewhat the following manner. If I wish to observe plants with some hope of satisfaction or enjoyment, I should be somewhat familiar with plants, interested in plants, perhaps I should even like plants. I know I like plants, but sometimes I wonder about being somewhat familiar with them, especially when one of my favorite specimens shrivels and dies. The kind of knowledge which is supported by observations and is not yet proved must be carefully distinguished from the truth. Knowledge supported only by observations is gained by plausible reasoning, by guessing. We should use such knowledge as an opportunity to investigate more exactly. This investigation we call demonstrative reasoning, the proof. The sequence is to make an observation which is followed with a guess; then make further observations with improved sensitivities. A repetition of this process eventually leads to an observation with well developed sensitivities, which is rewarded with a revelation of the truth. 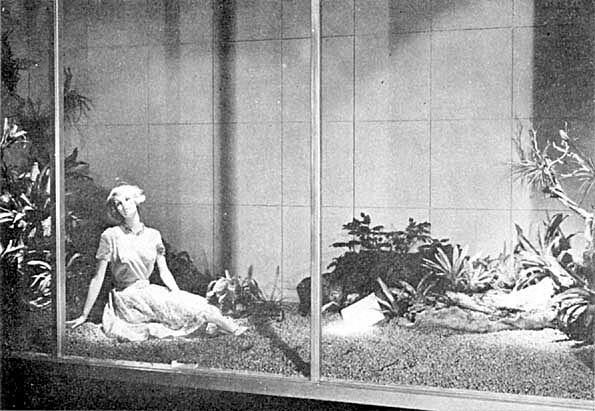 "How to Determine the Culture of Bromeliads from Their Appearance" by Walter Richter (May-April 1961 Bulletin). "Light and Color" by Roger K. Taylor and "Notes on the Intensity of Color in Spikes of Tillandsias" by David Barry, Jr. (January-February 1961 Bulletin). Many other articles could be added to this list. These are the variables; maybe there are more of them, but I decided to settle with this list for the first guess. I should be able to measure these factors. Lord Kelvin puts it this way: "When you can measure what you are speaking about and express it in numbers, you know something about it; but when you cannot measure it, when you cannot express it in numbers, your knowledge is of a meager and unsatisfactory kind; it may be the beginning of knowledge, but you have scarcely, in your thoughts, advanced to the stage of science." Going back to the theory that in solving a problem the answer must be guessed at before a proof can ever begin, I attempted to assign numerical values to each of the environmental factors listed. This exercise led me to the feeling that my first guess could be materially improved with further research, and the design of any experiment I might make should be deferred. This additional research effort led me into the field of meteorology. Among many other interesting sidelights, I found that the average of all types of precipitation contained a mean value of 2.15 mg. of nitrates per gallon, plus a sufficient quantity of free nitric acid to support an average PH value of 6.14. With this information, I was able to complete a list of numerical value limits for each of the environmental factors involved. I purchased a PH test kit from one of the local pet stores for $1.25, made a few preliminary measurements of the local water supply, and then designed my experimental plan. A brief description of the plan follows: The purpose of the plan was to determine whether or not the PH factor is important. Ten epiphytic Tillandsias were mounted on each of two branches. All factors were the same for each branch except for the PH value of the solution used for watering. Branch No. 1 was watered once every day with the local tap water which contained a commercial fertilizer in the amount of one quarter the recommended quantity. The PH of this solution was 7.4 (alkaline). Branch No. 2 was watered once every day with the local tap water which contained the same commercial fertilizer used for branch No. 1. The PH of this solution was adjusted to a value of 6 (acid) by the addition of nitric acid. There is some indication that the No. 2 branch is showing better color. The experiment has only been in progress a short time, however, and does not constitute a valid proof. In fact, the experiment may not prove a thing. The important thing is that it will be a worth-while observation which will help to improve my sensitivities and add to the enjoyment of my hobby. 4036 Via Solano, Palos Verdes Estates, Calif.
AVING ACQUIRED A PLANT OR TWO, either because of your own curiosity or interest or had them "wished" on you by a friend, what shall you do now? There are quite a few things you should do to "get started right." Let us examine these important items. In the first place, you have a bromeliad or several bromeliads (pronounced Brom-mee-lee-ads.) They belong to the Bromeliaceae (Bro-mee-lee-ay-see) family which has three sub-families, each of which has several genera (plural of genus) or groupings of plants, and each of these genera has a few or many species (associates of a particular genus) and then each of the species of a genus may have many varieties. The species alone number almost 2,000; so you can see the many, many different plants, all known as bromeliads, included in this prime category. As you become more acquainted with these plants, you discover that though they have no relationship with orchids, they do grow alongside orchids, either terrestrial, epiphytic, or saxicolous (rock growing). They, like orchids, are also tropical or semitropical. They are, however, in many respects, more adaptable than orchids, and, for example, some will even stand temperatures slightly below freezing. 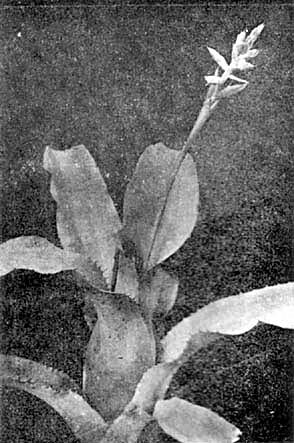 Further, whereas many orchids store water in their bulbs or leaves, bromeliads have, in many cases, developed a tankage system, a cup in the heart of the plant which can store water for use by the plant and obtain nutriment as insects, frogs, birds enrich this liquid, that is, in the wild state. All of which suggests that you, following the acquisition of a plant or two should immediately commence a little investigation. Did your friend or nursery, for instance, tell you whether these plants should be grown in soil or be grown more or less epiphytically in osmunda fiber or other very porous potting medium? Did you learn whether your plants would take full sun or should be given full or part time shade? The latter is, perhaps, the most important point from the standpoint of show-worthy plants. Yet it is almost impossible to stipulate a hard and fast rule. I have grown Aechmea miniata discolor, for instance, outdoors in Florida where it will take occasional full sun. When I grew this plant in a greenhouse with 70-80% light coloring was better, but a part of one leaf on a plant turned brown. Reason: just after sprinkling, a small shaft of direct sun came through a break in the shade cloth and happened to hit this leaf. Result: no longer a show-worthy plant. On the other hand, Aechmea distichantha has grown well in shade house, in greenhouse, and in continuous full summer-time Florida sun. The only variance in these plants was in slightly less green in the leaves, but as they are normally of a quite pale yellow-green, it is unnoticeable unless one is very familiar with this plant. As a fairly safe criterion, one may assume that the finer textured the leaf, the greater the need for avoidance of direct sun. Yet, here again, are exceptions. The genus Cryptanthus, most of which have stiff and sometimes thick leaves, do better in shade (with good light, however), and some varieties become quite washed out in color if exposed to full sun. It must be mentioned, though, that when speaking of shade I do not mean a 75 percent exclusion of light — rather the opposite. Shade, in this instance, is the elimination, more or less, of direct sunlight. In many cases, the deeper the shade, the greater the green, but as so many bromeliads have beautiful colorations we find that the greater the light without direct sun, the better the markings. In Europe there has been developed an Aechmea fasciata with the underside of the leaves completely white with a farinaceous powder. The upper side of the leaves is a pale green. This is largely a development in greenhouses in a northern climate and is distributed in the Netherlands, though in Germany are many of the deep green, white crossbanded plants. Here, in Florida, is grown the typical Aechmea fasciata with rich, deep-green leaves, undersides both green and cross banded with irregular white markings being very striking in appearance. These appear to do best when raised, matured, and brought to bloom in strong light but no direct sun. When acquiring some bromeliads, therefore, find out as much as you can about their sun or shade requirements and then use your own judgment. If you live in what we may term "northern climes," your sun problem may not be so pronounced as in the far South. Also the conditions in your home, your patio, your greenhouse, your window-box, or wherever you keep these plants may vary considerably, even from those of your next-door neighbor. That is why you must get acquainted with your plants. Bromeliads are adaptable only provided you attempt to understand their requirements and limitations. Of perhaps equal importance is the matter of potting medium. Here again if we seek information we may find a host of ideas, suggestions, and even contradictions. Recently, five bromeliad hobbyists and growers submitted as a panel their formulae for a good potting medium. All were different. At this point it is well to draw attention to the fact that commercial growers must, of necessity, find the best potting medium to meet their special conditions, whereas the individual collector or hobbyist can have more latitude in this direction. This also applies to containers, Many growers are now using plastic pots, which they maintain are superior to clay pots. In some ways they may be, but the individual may well find that clay pots have other factors better suited to their growing conditions and thus are superior to plastic containers. A good potting medium, where soil is required, and which is a simple one in use by quite a few hobbyists, is as follows: Combine three measures (they may be cups, spades, basins, or what not) of fine shredded or crumbled peat moss, one measure of clean builder's sand, one-half measure of fine granite chips, one-third measure of Perlite, and one-third measure of dehydrated cow manure. Some bromeliads, such, as Cryptanthus, like a richer mix, and to the foregoing more cow manure and perhaps some leaf mold may be added. Plants in this medium should be sprayed every week or ten days with a nutrient solution such as Hyponex (using one half the suggested formula for ornamentals) and between times with plain water, keeping the pots almost moist but never soggy. Drainage must be good in pots, and some broken pottery will accomplish this. For those unable to get the ingredients for a good "mix," don't be afraid to use just ordinary garden soil in place of peat moss, but you must either bake or sterilize the soil. Then, add builder's sand, and if the soil is rather clayey, add more sand the grit. The writer recently purchased a good looking specimen of Vriesea × mariae (always considered an epiphyte) only to find it in a hard lump of common garden soil! The epiphytes (air-plants) are potted in osmunda fiber, being packed in very tightly, with plenty of broken crockery at the bottom of the pot. Nurserymen are now using fir bark and other potting media which, again, is to meet their conditions. The individual will, as a rule, find osmunda fiber better in two ways: it breaks down more readily and thereby provides some nutriment for the plants, and it is better when dipping for pests (see next installment) as fir bark clutters the surface of the water. Following these (we hope) simple directions will be a step in the right direction to put YOUR "bromeliads on display." — 10301 65th Avenue, Largo, Florida. HE PRESENT NEW SPECIES brings to seven the total in Orthophytum discovered by Mulford Foster, not to mention two others where he furnished evidence for transfer to this genus. As in many other instances, his far-flung exploration followed by patient cultivation over the years has resulted in the discovery of one more species new to science. ORTHOPHYTUM SANCTUM L. B. Smith, sp. nov.
O. maracasense L. B. Smith in systema mea (Bromeliaceae of Brazil, Smithsonian Misc Coll. 126: 178-180, 1955) proxima sed inflorscentia apice exceptlaxa, bracteis primariis inferioribus longissime laminatis differt. Caudex short and thick, producing stolons; flowering plant 5-9 dm. high; leaves to 45 cm. long, green, covered with white appressed scales beneath, soon glabrous above; sheaths small and inconspicuous; blades narrowly triangular, acuminate, 3 cm. wide, laxly serrate with spreading retrorse teeth 2 mm. long, evenly channeled with a semicircular curve in cross-section; scape slender, erect, white-flocculose; scape-bracts foliaceous, large, spreading and exposing most of the scape; inflorescence 25 cm. long, lax except for the globose apex of a few spikes, white-lepidote becoming more or less glabrous with age; primary bracts foliaceous, spreading, the lowest very long and wholly covering the narrow few-flowered spikes, the highest much reduced and barely exceeding the globose spikes; upper spikes 25 mm. in diameter; floral bracts broadly ovate with an acuminate spreading or recurving apex, 2 cm. long, pectinate-serrate with recurved teeth; sepals narrowly elliptic-oblong acuminate, 14 mm. long, alate-carinate, white (Foster); petals slightly exceeding the sepals, white, appendaged well above the base. Type in the U. S. National Herbarium, collected on ground, near Santa Teresa, State of Espirito Santo, Brazil, altitude 900 m., August 7, 1940, by Mulford B. Foster (No. 846), and flowered by him in Orlando, Florida, December 1957. Observation of living plants has enabled Mulford Foster to furnish a number of characters that are lost in the dried herbarium specimens. For instance, the leaves of Orthophytum sanctum are green as contrasted with the salmon one of O. maracasense, and they have a perfectly semicircular cross-section where those of O. foliosum have one that is u-shaped in the center and flaring above. R. W. B. CHARLEY OF BILPIN, AUSTRALIA, makes this interesting comment on the effect of glare on his bromeliads: "Many people have been severely sunburned on a beach when high thin clouds deceived them into thinking there was no sun. In some of our glasshouses with fairly low ceilings, there was a perplexing curling and yellowing of odd leaves on otherwise perfect plants, particularly in Billbergia pyramidalis var. concolor, but not Billbergia pyramidalis, and also on Aechmea fulgens var. discolor. "It later was discovered that this was sunburn which struck directly onto leaves facing north. The sun beat onto the broad strip of these leaves, cooking this part, and causing the outer edges to curl in, making a tube. This did not kill the leaves but made the plant unsightly. "When painting the roofs on these glasshouses, the material was laid on too evenly, and the all-day sun was not broken up. The cure was found to be in painting broad green lines horizontally across the glass like slats. This broke up or filtered the direct rays of the sun and did away with continuous hot glare, without making the glasshouse too shady." Mr. Roger K. Taylor asks about the following: He says, "I have both Aechmea coelestis and Aechmea coelestis var. albo-marginata. Neither has bloomed, so I'm not sure they have arrived at mature size; but I suspect so, as both are producing suckers. The albo-marginata plant is by far the larger. Is it the case, as it appears to be, that these two characteristically differ in stature, as well as in leaf appearance?" (Ed. note: She has noticed no difference in the size of these plants; if anything, the albo-marginata is the smaller of the two.) What experience have others had with these plants? Lyman B. Smith has published in Boletim do Museu Paraense Emile Goeldi, No. 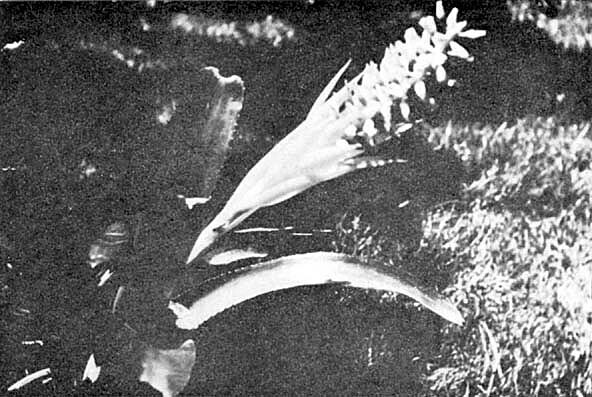 12, April 1961, from Belem, Brazil, a very interesting description of an unusual member of the genus Bromelia. He notes that this new species, Bromelia epiphytica (first collected by R. L. Froes in the state of Amazonas, Brazil, in 1949), and Bromelia interior (which he described from M. B. Foster's collection in 1940) are the only two examples, among some forty known species in the genus Bromelia, that have an epiphytic habit. It is interesting to note in this connection that these Bromelias are not the only ones that have taken to the air. In the conservatory in Golden Gate Park in San Francisco, California, Bromelia balansae is grown as an epiphyte and appears to be thriving. Yes, indeed, bromeliads are adaptable plants! In an article "Plants of the North-eastern Desert," by Octavio Domingos, the author tells about a bromeliad called "macambira" which grows in Brazil. He says: "Another spiny plant is the macambira, a relative of the pineapple and somewhat like it in appearance. The plant has no stem; its long leaves have spines along their edge. In areas where it grows wild it is used for feeding cattle in times of drought. It will keep the animals alive. One way to make use of it is to set fire to area where it grows to burn away the spiny leaf-blades, leaving the lower part where the thick leaf-sheaths form a head, unharmed. The head is about the size of a man's fist and contains 50% of an amylaceous substance. Another process is to cut away the blades, pull up the heads and load them on a truck to be driven to where the hungry cattle are waiting — as well as man — for rain and better days." Aechmea bromeliifolia (Rudge) Baker var. rubra M. B. Foster var. nov.
A var. bromeliifolia foliis rubris differt. 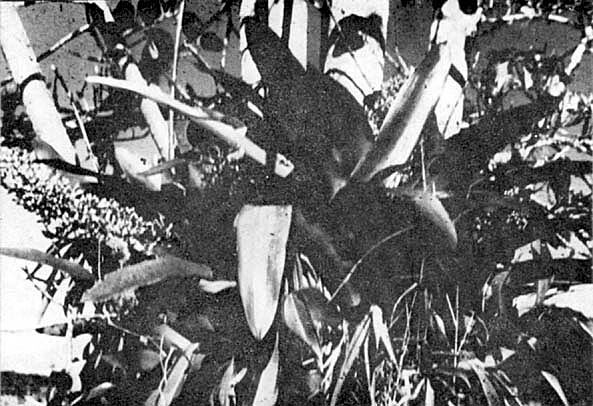 OLLECTED IN BRAZIL GROWING AMONG ROCKS in municipio conecicao in the state of Minas Gerais, July 12, 1940, by M. B. and R. Foster, No. 629; Type U. S. Nat'l. Herbarium. We collected the species Ae. bromeliifolia from Mexico to the southern part of Brazil, as it has, possibly, the greatest natural range of any species in the genus. It appears that this variety rubra is the handsomest of any of the different variations that have been observed to date. With its subtle reddish foliage this stately plant makes an excellent cluster group in any subtropical area or in the ground at the base of a tree. It seems especially frost hardy and none have been injured in the cold dips in the mid-twenties temperatures experienced in Florida. A. marmorata (1855) Found on trees in Brazilian forests. This tall, tubular plant, which looks more like a Billbergia than it does an Aechmea, is sometimes called the "Grecian Vase," which it most definitely resembles. From grey-green leaves, cross-banded with darker green, arises a beautiful arching stalk bearing bright pink bracts and blue flowers. Any very well drained potting medium seems to make it happy. Needs good light. This is an outstandingly lovely plant and should do well in the house. A. mertensii (1818) Found growing in the ground and on trees in the forests of Trinidad and northern South America. Dr. Smith states that this is one of the most variable species in all the Bromeliaceae because of the extreme range in the size of flowers and in the size and density of the inflorescence. The plant is medium sized with bright green scaly leaves edged with dark brown teeth. The spike, (one foot in height) is covered with red bracts and is topped by a dense cylindrical flower head of yellow flowers. The berries upon maturing turn a deep chicory blue. A collector's item. A. miniata var. discolor (1857) Epiphytic in Bahia, Brazil. An outstanding, medium-sized plant, with outspreading leaves of rich olive-green on top and glossy maroon underneath. The inflorescence is an erect spike of berry-like fruit with blue flowers, the berries turning red and lasting many months. This is a highly decorative plant which does very well in the home. Does best in a well-drained potting mixture and needs good light. Hardy. A. miniata var. miniata is also a very fine subject. It grows somewhat larger and the leaves are a lovely delicate green. A. miniata var. discolor × A. fulgens var. discolor (1954) This hybrid of unknown origin was introduced into the trade as A. × maginalii, It is a fine cross combining the best qualities of both parents. Leaves are apple-green on upper side, soft maroon beneath. The bracts are salmon red, the flowers a bright blue which turn into orange berries lasting for several months. Like A. miniata var. discolor, it is a dependable bloomer. A. nudicaulis (1753) Found growing on trees and rocks, sometimes in full sun, from Mexico and the West Indies into Venezuela. The stiff, spined, grey-green leaves form a tubular rosette from which emerges the brilliant inflorescence of bright red bracts and yellow flowers. The flowers do not last so long in color as do those of other Aechmeas, but no other Aechmea puts on a brighter display. The variety A. nudicaulis var. cuspidata, confined to South America, is similar except that the plant tends to be heavier with broader leaves which also show slight horizontal silver markings. It was first introduced in 1879. A third variety, A. nudicaulis var. aureo-rosea, was found in Brazil in 1881. It differs from the others in that it is smaller, its leaves are more obviously cross-banded, and the inflorescence is stiffer, the frosty-white berries turning a pinkish color. All three varieties are hardy and will take almost any kind of treatment. A. organensis (1880) Found growing on the ground and on the trees from Organ Mts. to the extreme southern part of Brazil. This is a medium-sized plant with stiff, dark green leaves. The flowers are blue and the fruits are burnt orange. A hardy, robust Aechmea. A. orlandiana (1939) Discovered by Mulford Foster growing in the forests of central Brazil and named in honor of the city, which due to his efforts has become the home of the world's largest collection of living bromeliads. "Bizarre" best describes this Aechmea with its zigzag markings of dark chocolate on pale green leaves. The lower leaves of this medium-sized plant tend to droop, a feature which further distinguishes it from others. The striking orange spike of white and yellow flowers appears in winter. This plant is sometimes difficult to grow, but is well worth the effort. It definitely needs good light. Does well on bromeliad trees, fern, or soil. A. ornata var. ornata (1843) Found growing on trees or on the ground in the forests and restingas of Brazil. Formerly known as A. hystrix. A hardy, medium-sized plant with stiff olive-green foliage, it has been referred to as "the porcupine Aechmea." Flowers are pale rose or red. When it is out of flower, this Aechmea can be mistaken for an agave: It is a tough plant that can stand rough treatment and full sun. A. pectinata (1879) Found growing on trees and on the ground in the restingas of Brazil. An open, stiff rosette with mottled soft green leaves which turn rose in the center, this Aechmea may attain a spread of two feet. It has a compact pineapple-like head on a medium spike; flowers are green. This plant is an extremely shy bloomer, but it is worth growing for its foliage alone. Makes an excellent yard plant in temperate regions. A. pimenti-velosoi (1952) Grows on trees in the southern forests of Brazil. This is a charming small plant with stiff green leaves forming a tubular rosette. Has a rather compact cylindrical head of yellow flowers. Not a very fussy grower and hardy. A. pineliana var. pineliana (1854) Found growing in the forests of Brazil. This is an attractive, medium-sized hardy plant with slender leaves of grey-pink. In the sun, the leaves tend to turn a rich rose. The inflorescence consists of a stiff, erect stem, pinkish bracts and a cone-shaped head of yellow flowers. Conspicuous dark spines enhance the beauty of the leaves. There is a miniature form of his plant known as A. pineliana var. minuta, which has a colorful gray-bronze foliage. Not fussy as to potting medium. A. pubescens (1879) Found growing in trees in partially cleared forests and on the ground in moist open woods from Honduras to Colombia. This is an attractive medium-sized plant with a rather loose but graceful rosette of broad dusty green leaves with pubescent scales. It is quite variable in both size and coloring according to its native habitat. In some plants the leaves are plain green; in others they are a reddish brown. The branched inflorescence, which is both unusual and attractive, appears at the end of a thin red stem, the straw-colored petals of the flowers turning to blue berries which last in color for many months. Not a fussy grower, it is hardy. Prefers good light. A. purpureo-rosea (1834) Epiphytic in the coastal forests of central Brazil. This medium-sized Aechmea has deep green heavily textured leaves, edged with black spines, which form a tall tubular rosette. The mealy coated scape bears a long panicle of rosy-red bracts and lavender flowers. An attractive plant, it is hardy and not fussy as to culture. A. racinae var. racinae (1940) Epiphytic in the rain forests of Brazil. This attractive Aechmea, often called "Christmas Jewels" because of its habit of blooming at the holiday season, was originally named in honor of Racine Foster, its co-discoverer. This is a small plant with soft, glossy green leaves. The inflorescence appears at the end of a pendant stem; the yellow and black flowers turning into brilliant orange-red berries which last in color for many months. To display the inflorescence to its best advantage this plant should be grown in a hanging basket or else attached to a bark slab or a bromeliad tree. It prefers semi-shade. A. ramosa var. ramosa (1889) Found growing on trees in central Brazil. This is a stunning Aechmea which seems to be perfectly hardy. A medium-sized to large plant, its foliage may vary in color from rose-pink to soft green. The inflorescence which rises well above the leaves on an orange scape, has many branches. The colorful inflorescence of greenish-yellow berries and yellow flowers may be likened to a swarm of bees and is attractive for about six months. An easy Aechmea to grow, it is not fussy as to the care given it. A. recurvata There are a number of varieties of this particular Aechmea, all of which are native to Brazil. A recurvata var. recurvata (1856) grows on rocks and trees and resembles a Dyckia in form and leaf texture. It is a small to medium-sized plant with spiny edges and an inflorescence completely exserted above the leaf-sheaths. The floral bracts are serrate. A. recurvata var. benrathii (1866) is found growing on coastal rocks in full sun. This is a tiny plant and could easily be mistaken for a Tillandsia. The stiff green leaves form a tight head, the rose flowers being partly hidden by the recurved leaves. The inner leaves turn red when the plant is about to bloom — an unusual trait for this genus. A. recurvata var. ortgiesii (1899) is found growing on trees and rocks in part to full sun. This is a medium-sized plant with numerous leaves of a shiny rich green which form a tight rosette. The inflorescence of red bracts and berry-like fruit are almost or wholly included by the leaf sheaths. All these plants are hardy and easy to grow. A. × 'Royal Wine' (1947) This handsome hybrid by Mulford B. Foster is a cross between A. miniata var. discolor and A. victoriana var. discolor. It is a beautiful plant with outstanding broad leathery leaves which are pale olive-green on their upper side and lacquered wine-red underneath. The partly pendant inflorescence has blue flowers which turn into deep orange berries. This is a fine plant for the home, as it is as hardy as either of its parents and will withstand a certain amount of neglect. It likes light, but not direct sun. Is attractive whether in flower or not. A. tessmanii (1927) Found growing on trees in dense forests and on river banks in Colombia and Peru. The stiff, gray-green leaves form a medium-sized tight rosette. The branched inflorescence of orange-red berry-like fruit with yellow flowers makes this a most desirable plant. It does well in either soil or tree fern, but where the water is highly alkaline, tree fern is recommended. Although it is a fussy plant and not hardy, it is none the less well worth trying. A. tillandsioides var. tillandsioides (1830) Epiphytic in the rain forests from Mexico to Brazil. The shiny green leaves and branched inflorescence with its red bracts, white flowers and blue berries make this a most attractive plant. It is a stocky Aechmea, known sometimes as "the red, white, and blue bromeliad," for its fruits ripen one at a time. Another variety, A. tillandsioides var. kienastii, is similar, but smaller and the inflorescence is appreciably shorter and with fewer branches. This is the best variety for the house. This Aechmea does well in soil or tree fern. A. triangularis (1940) A native of Brazil, where it is found growing on trees. This striking bromeliad is a member of that group of Aechmeas to which A. lamarchei, A. bromeliifolia, A. chorophylla, and others belong. All have a compact cylindric, strobilate flower head, the petals of which turn jet black the second or third day after coming into bloom — the inflorescence thus being at least three colors at once. In the case of A. triangularis, the petals are purple and the flower stem a brilliant red. This is a medium-sized plant with stiff, heavily spiked, bright green leaves which form a rather tight but graceful rosette. The leaves are quite broad at the base, but sharply come to a point. A stunning plant, whether in bloom or not, it is rather tender despite its robust appearance. It prefers fir bark or tree fern. It did best for this writer when it was left forgotten under the bench, although for most growers it does well in a strong light. A. victoriana (1941) Found growing on rocks and on the ground in Brazil. This is a medium-sized Aechmea with bright green leaves. The inflorescence is unusual, first showing as a semi-pendant string of red beads, clustered on the stem. The beads, which break out into peach and purple flowers, later turn into deep brownish-black berries. The cluster of fruits is often 6 to 8 inches long. A fairly hardy plant, it is easy to grow, not being fussy as to potting mixture. A. victoriana var. discolor is a red-leaved variety, which is of unusual attractiveness. A. weilbachii var. weilbachii (1879) Found growing in central Brazil. This is a fairly hardy species. This variety has leaves that are entirely green. Better known is A. weilbachii var. leodiensis (1887) whose leaves are bronze-red tinged with purple. The inflorescence consists of a stem with crimson bracts and a panicle of orchid-shaded berries and flowers. This is a vigorous plant which suckers freely and is one that should be in every collection.